Archivist of the United States Allen Weinstein and Google Co-Founder and President of Technology Sergey Brin today announced the launch of a pilot program to make holdings of the National Archives available for free online. 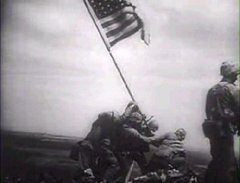 This non-exclusive agreement will enable researchers and the general public to access a diverse collection of historic movies, documentaries and other films from the National Archives via Google Video as well as the National Archives website. Exchange traded funds (ETFs) are an increasingly popular investment. ETFs are open-end mutual funds that, unlike traditional open-end funds, trade on exchanges, such as the NYSE and AMEX. The fact that they can be bought or sold throughout the day is one of their advantages over ordinary open-end funds, which only allow purchases and sales at the end of the day. But the big advantage of ETFs is that the sale of securities inside the fund does not typically generate taxable capital gains for ETF shareholders. We suggest a simplification of the tax code that levels the playing field for ETFs and ordinary funds. Taxation of distributed dividends continues. (It hits the shareholders of ETFs and ordinary funds in the same way.) But taxation of capital gains occurs only when fund shareholders redeem their shares. In other words, we suggest that mutual fund capital gains should be taxed in the same way as gains on other securities. This is the system in many other countries. How do you type Chinese characters on a keyboard? You use a piece of software called an input method editor, which allows conventional-looking keyboards to produce the thousands of characters used in written Chinese. There’s no standard system, though, so two Chinese keyboards may not look exactly the same and they may not function in the same way. In the Peoples’ Republic of China, most computer users type out their Chinese in transliteration, using the standard Roman alphabet keys on a QWERTY keyboard. To generate a character, you type out its sound according to the same spelling system — called Pinyin — that represents the name of China’s capital with the word ‘Beijing.’ The computer automatically converts the Pinyin spelling to the correct Chinese characters on the screen. Europe’s ‘Little Ice Age’ may have been triggered by the 14th Century Black Death plague, according to a new study. You may already know about Joe Kittinger’s jump from a 20-story-tall helium balloon at the edge of space, 19 miles up, in 1960. I blogged on it recently. He reached 714 miles per hour, breaking the sound barrier without a vehicle, before a small stabilizing ‘chute and a later, bigger parachute slowed his fall. Now a Frenchman named Michel Fournier aims to top the feat. In 1988, two years after the U.S. Space Shuttle Challenger exploded on ascent 11 miles up, managers of Europe’s space program selected the paratrooper as one of three people to leap from 25 miles up. Scientists wanted to see whether an ejection higher than Col. Kittinger’s jump is survivable. After doing initial tests with lifelike dummies, Europe abandoned its ambitions for manned spaceflight and scrubbed the jump. 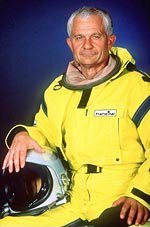 Mr. Fournier wasn’t so easily grounded, and in 1992 he retired to pursue the plunge solo. He has since amassed $12 million in gear — and impoverished himself. He sold his house, antique furniture and gun collection to buy the mothballed European jump equipment and a massive balloon capable of rising higher than planes can fly. He cajoled sponsors to pitch in high-tech gear, including a pressure suit and life-support system that took nearly three years to develop. Belly-flopping from the edge of space isn’t just an incredibly long parachute ride. At that altitude, conditions quickly turn deadly. Above 40,000 feet, the atmosphere is so thin that unprotected people lose consciousness in around 12 seconds. Even with an air supply, nitrogen bubbles may form in the blood and soft tissue if the jumper hasn’t prepared by inhaling pure oxygen for several hours. If the jumper is unprotected above 50,000 feet or so, saliva boils off the tongue, and body parts begin swelling painfully. Lungs may hemorrhage as they and the skull fill with liquid. On Col. Kittinger’s ascent to his record leap, his right glove broke, causing his exposed hand to balloon. A Soviet officer died two years later from pressure sickness in a similar attempt when his face mask cracked. An American sky diver died from decompression trying to beat the record in 1966. The Giraffe Manor, built in 1932 by Sir David Duncan, is situated on 120 acres of land just a few miles from the centre of Nairobi, Kenya’s capital city. In 1974 Jock Leslie-Melville, grandson of a Scottish earl, and his wife Betty, who also founded the African Fund for Endangered Wildlife (AFEW), bought the Manor. They then moved five babies of the highly endangered Rothschild giraffe to their property where they have been successfully reared and they now have their own babies. When Jock died, Betty decided to open her house, now called the Giraffe Manor, to visitors. 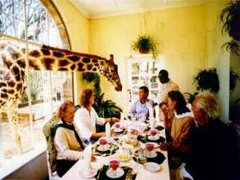 Exclusive, spacious and elegant, it is the only place in the world that you can feed giraffe from your second floor bedroom window, over the lunch table, and at the front door. Guests can feed and photograph the giraffe and the Warthogs at the Manor, and also wander through the adjoining primeval forest to view the bushbuck, dik dik, and more than 180 species of birds. Is the left out of ideas? The left used to have a Big Idea: The free market doesn’t work, so the government will fix it. The social democrats disagreed with the Socialists and the Scoop Jackson democrats about how much fixing was necessary, but they all agreed on a basic premise, and could sell that simple message to the public. Then, after fifty years or so, people noticed that the government didn’t seem to work any better than the free market . . . worse, actually, in a lot of cases . . . and it was awfully expensive and surly. Conservatives stepped in with their Big Idea: the government screws things up, so let’s leave more stuff up to individuals, which, if nothing else, will be a lot cheaper. Obviously, liberals disagree with this . . . but they have not come up with a Big, Easily Sellable, Idea With Obvious Policy Prescriptions to replace it. Some of them have just kept repeating the old Big Idea, which it seems to me that fewer and fewer people believe, as the US continues to pull ahead of its economic peers. Others have focused on coming up with lots of little ideas . . . but those take up too much time and energy to attract voters. Gore tried to whang up anger against pharmaceutical companies, and Kerry tried to stoke anger against Bush, as replacement. But in politics, there’s just no replacement for the Big Idea. If normal people started selling their diamonds on the open market, the De Beers cartel would lose much of its monopoly power. The Drawn! blog calls it The Da Vinci Lode. 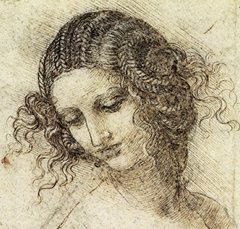 It’s a collection of Leonardo’s drawings, from medical studies, to scientific diagrams, to flying machines. 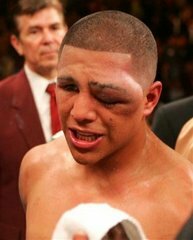 Fernando Vargas reacts after losing to Shane Mosley during their junior middleweight boxing match at Mandalay Bay in Las Vegas on Saturday, Feb. 25, 2006. The fight was called by referee Joe Cortez due to swelling on Vargas’s left eye. 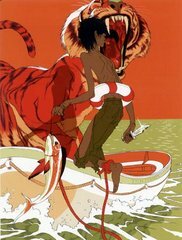 In October, The Times and Canongate Books launched a competition to find an illustrator for a new edition of Yann Martel’s Man Booker-prizewinning novel Life of Pi . Today we feature the five shortlisted images, chosen by our judging panel out of some 600 entries. Five more artists have been selected from those who entered via The Globe and Mail newspaper in Canada, and another five from those who submitted their illustrations to The Age in Australia. All 15 shortlisted artists will submit three more illustrations each before an overall winner is chosen in April. His name’s David Bernal, and he goes by the nom de danse of Elsewhere.